Empty Multichannel PPM in a 19 inch 3ru chassis. With another set of optional cards up to 40 channels can be shown. 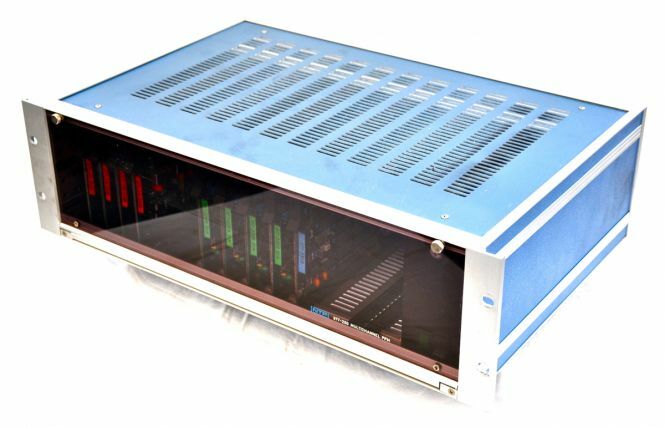 Empty frame with psu. No cards installed! The pictures show the rack with cards installed, but it will come with NO CARDS INSIDE! The 377-200 multichannel PPM is used for measuring the peak levels of up to 40 audio channels before presenting the measured values as vertical bars on a standard RGB colour monitor. Five versions are available, with respectively 8, 16, 24, 32 and 40 channels. The external RGB colour monitor is not included. - Up to 40 channels displayed on a standard RGB colour monitor. - High impedance transformercoupled audio inputs. - Remote—controlled colour coding of individual channels for easy channel identification. - All electronics housed in a 19 inch wide, 3 unit high cabinet. - 1/3 octave real—time analizer available as option.